On the cover of her EP Edge Of, Maya Laner stands unnaturally tall, looking over her shoulder with an ice-blue stare as she holds a microphone up to her mouth, the cord snaking around and under her bare feet. Every time I play the record and look at that image taken by Chris Maggio, I'm impressed with the photographer’s edits: it seemed he had expertly stretched Laner into a giant without distorting her dress or the background at all. It wasn’t until I saw how surprisingly hairy Laner’s legs looked that I started to get a clue. Really, the cover art seems like a perfect representation of the EP’s contents: it’s a bit humorous and a bit serious, bright with dark undertones. Laner’s blue stare both intimidating and inviting. It’s about contrasting emotions and striking imagery—blue acting as the “essential color of the hyper-emotional world,” she says, in which her music lives. And it’s a bright blue—a wading pool reflecting the big, cloudless Texas skies she saw for the first time on tour when she playing bass for Porches. During performances, Laner always dons the blue contacts because, as she puts it, they allow her to “create a character and remove myself from the space,” subverting the audience’s expectations. By becoming a hyperbolic version of herself, by making a spectacle, she “sneaks you in” to the ultra-curated world she wants you to experience on your own. This is True Blue. And after a couple of years spent touring under someone else’s name, Laner is ready to branch off on her own. But Edge Of, released earlier this year, is unlike most freshman releases. Finished in July 2017, it’s a sonic amalgam of past and future, varied influences and multiple genres. Honestly, it’s a sound I have never encountered before, and when I try to describe it as whimsical, Laner rejects the notion. She’s heard that description a few too many times—but doesn’t blame listeners for any of their reactions to, or relationship with, her music. And of course, she’s right. While Edge Of is layered with ricocheting, twanging samples that evoke Ariel Pink’s Pom Pom or the production of Cole M.G.N, it manages not to be cartoonish or cutesy. It’s bass-driven, dark, sometimes intentionally saccharine; it’s Laner’s effort to establish her own brand—it’s a bit of world-making, just like the little world she created in her basement studio where she writes and records all of her songs. 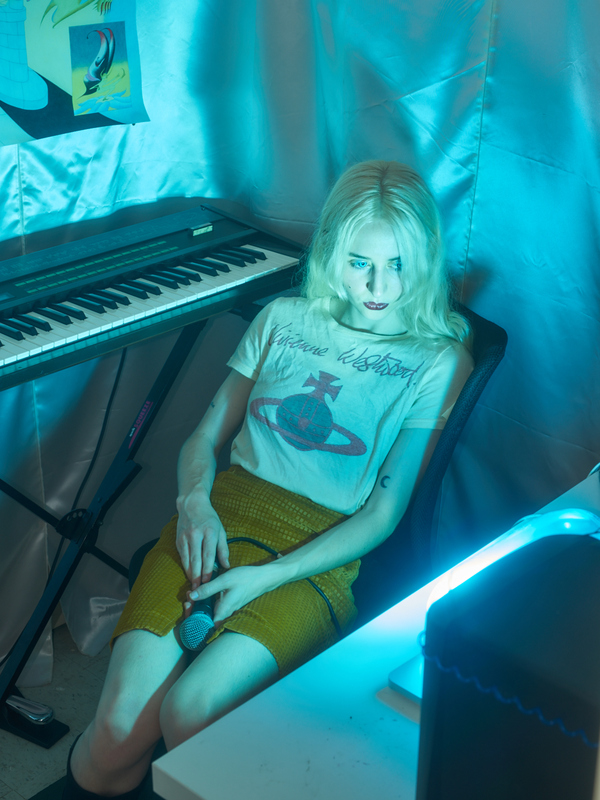 By covering the walls in satin and turning the closet into a private sound booth, Laner has built a space where she can go to really hone into the deeply personal, “empathic” world from which the EP sprung. But Laner’s not too worried about how “clean” the early drafts of tracks come out, as long as they capture the feeling she needs to convey. And that feeling is only further embodied by her insanely inventive, imaginative lyrics: “Was it tears in his eyes/Or just a Visine lie,” she croons on standout track "Tell Me Texas." While Laner has tons of experience performing live, she’s only been onstage as True Blue a handful of times. But that’s changing, as she’s recently been booked more and more across America, and even in the U.K., playing with acts like Girlpool, Unknown Mortal Orchestra and Shamir. “I love to play with my onstage choreography,” she says, “and mess with the way that the audience sees me,” her experience as a visual artist always informing her stage choices. Above all, though, “I just give something to the audience while also receiving something,” says Laner. Through her music, and performances, she wants to form a relationship with the listener so that something’s at stake besides her own career, or music, or ideas. For her, it has to be a dialogue if it’s going to be meaningful—which, clearly, it is. 'Edge Of' is out now. His important new album 'The Mugician' is out today. How the rapper's music helped bring a patient back from a traumatic brain injury.